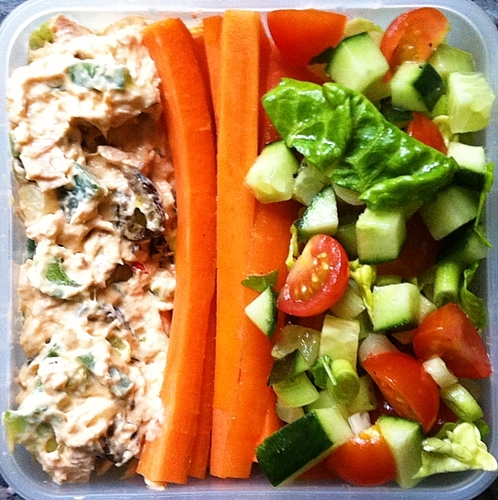 This one consists of spicy tuna salad (omit the red kidney beans; add some black olives – enough for two servings), carrot sticks (they also serve as a barrier between the two salads), and little gem lettuce, cherry tomatoes, cucumber and fresh coriander salad). This used up some left-over brown rice. Mixed the rice with spring onions, frozen peas and salted, roasted peanuts; and a dressing made from soy sauce, olive oil, a little hot chilli sauce, a little white wine vinegar and some grated ginger. 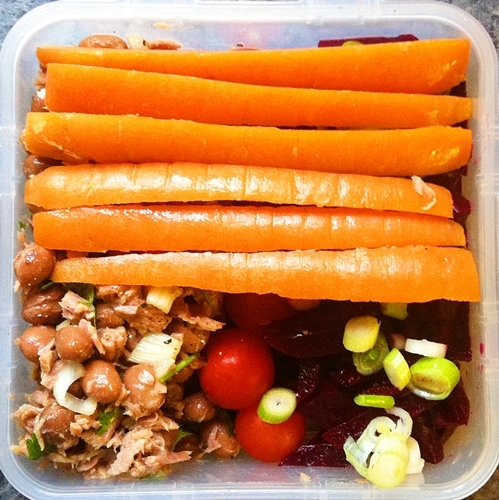 Also cherry tomatoes, beetroot, spring onions and carrot sticks. Nasi goreng is just as good cold, as it is hot. So I used the left-overs in a lunchbox. 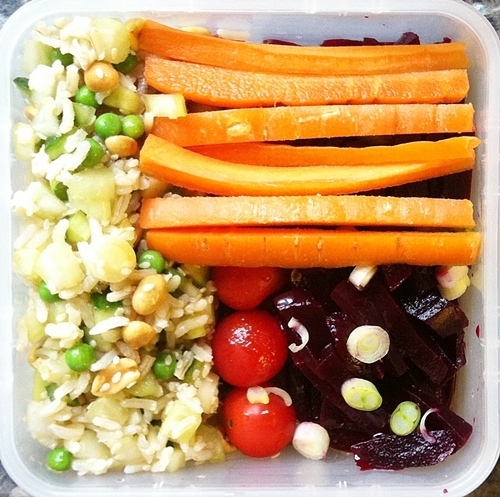 The other ingredients are the usual suspects: cherry vine tomatoes, beetroot, spring onions, carrot sticks and oil and vinegar dressing. 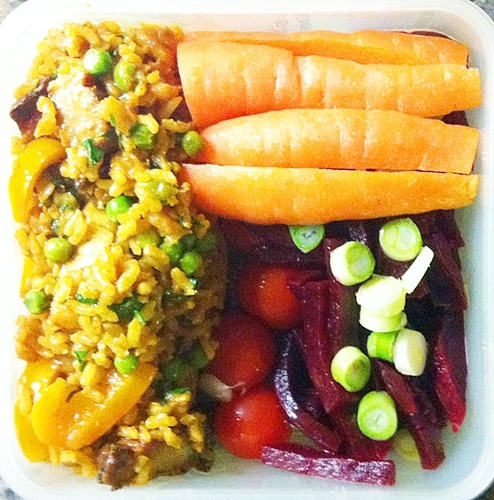 This used up the remaining red kidney beans and left-over brown rice from the chipotle prawns. Rice salad made with cooked brown rice, red kidney beans, spring onions, chopped sun-dried tomatoes, harissa, olive oil and vinegar. 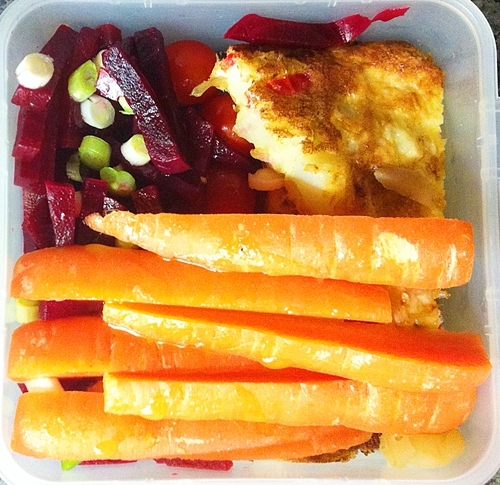 Also cherry tomatoes, beetroot and celery, and carrot sticks. This time the major component is the remains of a tortilla. 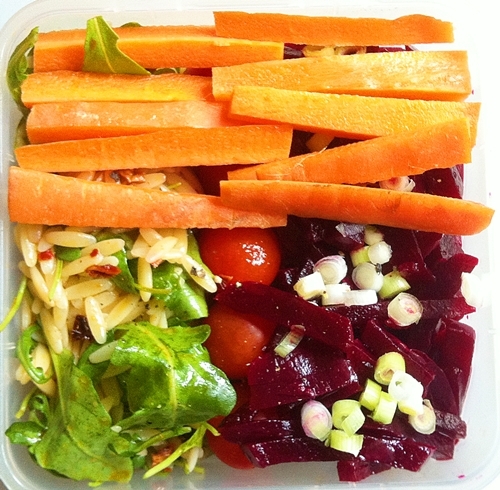 The rest – as before: cherry vine tomatoes, beetroot, spring onions, carrot sticks and oil and vinegar dressing. Among the usual suspects is a salad made from orzo, wild rocket, sun dried tomatoes with a dressing of harissa, oil and vinegar. 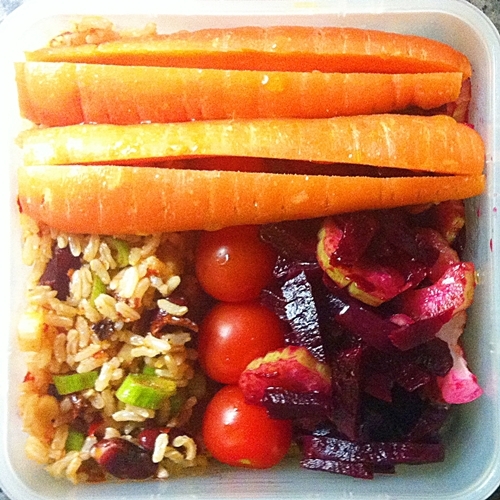 The usual suspects: cherry vine tomatoes, beetroot,spring onions, carrot sticks and oil and vinegar dressing.